With the possible exception of THE FLINTSTONES and THE SIMPSONS, few fictional families are as iconic as THE ADDAMS FAMILY. Charles Addams’ kooky clan have come a long way since their first appearance as a comic strip in 1938, with a new musical incarnation finally stepping into the UK footlights some seven years after first arriving on Broadway. THE ADDAMS FAMILY picks up several years after we last saw the family in the early Nineties. Little Wednesday Addams (Carrie Hope Fletcher) is all grown up and has fallen in love with the sweet and smart Lucas Beineke, a young man from a ‘normal’, respectable family. With plans to marry her new love, Wednesday confides about her engagement to her father Gomez (Cameron Blakely) but begs him to keep it a secret from her mother Morticia (Samantha Womack). Can Gomez keep his daughter’s secret until the two families meet for a fateful dinner or will the creepy family get-together scare off Wednesday’s future family-in-law? 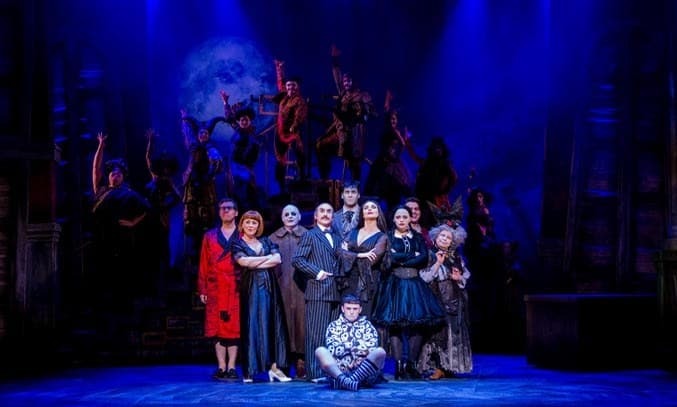 Written by Rick Elice and Marhall Brickman’s (the writers of multi award-winning hit musical JERSEY BOYS), THE ADDAMS FAMILY is a story of love, family and friendship with a kooky twist. The creative team have clearly worked hard to bring Addams’ weird and wonderful family devilishly to life on stage. Diego Pitrach’s playful set is both striking and ingenious, becoming a character of its own, with its crooked shutters, living portraits and ‘Thing’ sliding in and out of a letterbox. Andrew Lippa’s lively score keeps the energy and the comedy high with its clipped melodies and off-beat lyrics, while Alistair David’s choreography is suitably spooky with its super-sharp gestures and quirky disco steps. Cameron Blakely delivers a charming and seductive performance as Gomez Addams, beautifully balancing the conflicting demands of his wife and daughter. Samantha Womack is equally entertaining as Morticia, although her stiff posture feels a little forced at times. 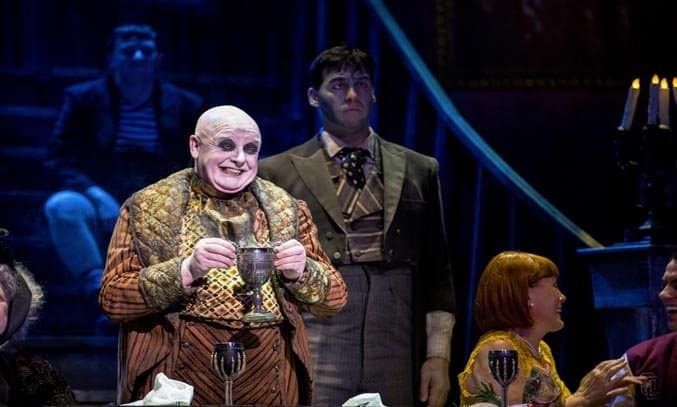 But the real stars of the show are Carrie Hope Fletcher, who shines as the conflicted Wednesday, packing a punch on her solo numbers, and Les Dennis, who looks unrecognisable as the egg-head Uncle Fester, who acts a narrator of the story. The only real disappointment is the plot, which is weak, predictable and lacking in any real suspense, leaving the majority of the second act plodding along from number to number. The omission of the famous signature tune – other than a few bars from the orchestra – is also real shame, particularly at the curtain call. Yet, what THE ADDAMS FAMILY lacks in drama and narrative, it more than makes up for in atmosphere and cast performance. All in all, a suitably spooky (or should we say kooky) night for fans old and new.